Reincarnation is a concept of Hinduism mentioned in the Upanishads, Puranas, Bhagavad Gita, but I could not find its mention in the Veda Samhitas. Is it mentioned in the four Vedas, that is in the Vedic Samhitas: Rig Veda, Yajur Veda, Sama Veda or the Atharva Veda? Well, there are several hymns in Vedas which can mention rebirth. However it depends upon interpretation. I've found couple of verses from Rigveda Mandala 1 of which interpretation mention rebirth according to Swami Dayananda Sarasvati, the founder of Arya Samaj. Though Ralph Griffith or Gayatri Pariwar's translation doesn't mention rebirth. O men, we certainly believe in om eternal, Immortal God who is dispense of fruit of good or bad actions done by us and according to Whose laws we get rebirth. You must also know that one God to be giver of rebirth, non else can do this work. It is he who gives birth to emancipated persons also through parents at the end of MahaKalpa. RV mentions reincarnation in mandala X hymn 56, however the notion of reincarnation is different from as we know it today. After a person dies his soul starts journey to some unknown world. 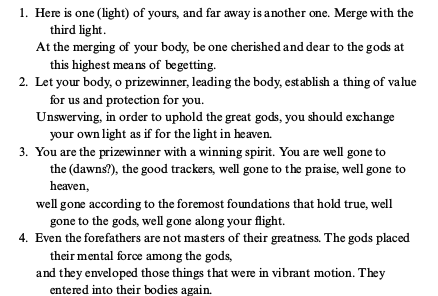 Then the Gods transfer his soul to their domain and unites the soul with body. So the notion is similar to what ancient Egyptians had where after death soul unites with body and the person starts enjoying life again after being dead! There is no explicit mention of reincarnation in the Vedic Samhitas. However, some people think that some verses in the Vedic Samhitas can be interpreted to mean reincarnation. I have heard the mention of two pathways, of birth and death, the ways of parents, the learned and the mortals. On these two roads each moving creature travels. Each soul leaves the present parents and assumes new ones. Verses, and songs,and magic hymns,purana,sacrificial text.all the celestial Gods whose home is heaven sprang from the residue. (Atharva Veda book 11,hymn 7 verse 24). 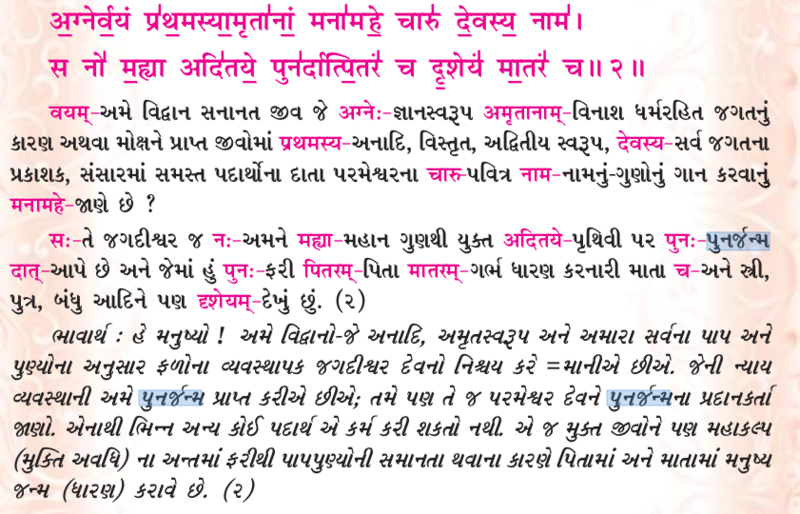 Lord vishnu's vamana avatar is mentioned in samhitas, the three gunas are mentioned in atharva veda- if there is mention of avatars in Vedas like vamana- sage narayana then it will support rebirth too. The samhitas are part of upasana and devata kanda finding karma and rebirth in them is impossible. Brahmanas are karma kanda you won't find them mentioning rebirth or other such philosophy. Each part of veda is for different reason. Brahmanas is for rituals. Not the answer you're looking for? Browse other questions tagged vedas rebirth samhita . Is Moksha compulsorily given to every died people by their family? Are the 3 gunas mentioned in the Vedas?